Travel around Taiwan to explore cases of social and environmental resilience. 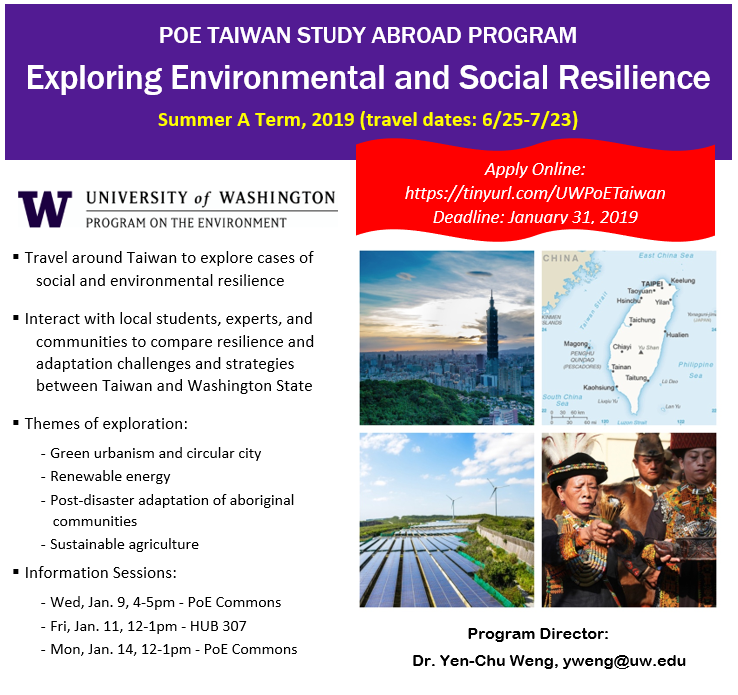 Interact with local students, experts, and communities to compare resilience and adaptation challenges and strategies between Taiwan and Washington State. Earn credits in Environmental Studies and/or International Studies. Please view details in the attached flyer or contact Program Director, Yen-Chu Weng (yweng) for more information. A capstone project is available for 1-2 students interested in working with King County Solid Waste Division to identify viable options for leachate treatment at the Cedar Hills Landfill. As a first step toward improving leachate treatment at the Cedar Hills Landfill, current trends and knowledge for treatment will be evaluated and ranked. This project is in cooperation with the Cedar Hills Regional Landfill. At a minimum, student will interact with Engineers at King County Solid Waste (1) during the literature gathering, (2) to present identified options, and (3) to provide a copy of the final ESRM report. Students will also have opportunity to visit the leachate treatment systems at the Cedar Hills Landfill. Tasks will include library research to evaluate the current state of knowledge, and synthesis of this information into comparison of up to 3 viable treatment options for the Cedar Hills Landfill. Students are expected to spend an average of 15 hours per week for two quarters (e.g. 5 credits for winter and spring quarters). Tasks are both independent and in a small group; students prepare a work schedule at the start of each quarter showing time for individual and group work. Students attend Gough Lab Group meetings for 1 hour per week. The selected students should be comfortable with chemistry (2 quarters minimum) and mathematics. Students are required to be enthusiastic about working with staff engineers, comfortable with self-directed learning based on reading materials, self-motivated, and have strong time management skills. Ideal applicants may also have course work in advanced chemistry, calculus, statistics, or economics. Capstone credits, ideally at 5 credits per quarter. Submit a statement of interest, resume, and unofficial transcripts to Dr. Heidi Gough at hgough. The email subject line should state: “Leachate Capstone”. January 9, 2019 5PM, or until filled. Come support your SEFS peers and learn about some cool research! See the attached flyer for a list of poster presenters and their topics. · What? The UW Library Research Award for Undergraduates recognizes outstanding research projects in all formats created by undergraduate students. · When? Deadline to submit is Monday, May 7, 2018, by 5:00pm PDT. · Where and How? Submission criteria and guidelines are available online. Looking for a Senior Capstone Project? Please see attached flyer for details how to apply! A capstone project opportunity is available for one student interested in exploring the genetic and morphological characteristics of high-impact pathogens. Comments Off on Looking for a Senior Capstone Project? This program provides indirect funding for undergraduate students to participate in research. The National Science Foundation website (https://www.nsf.gov/crssprgm/reu/reu_search.jsp) provides links to REU programs in various discplines (e.g. Ocean Sciences) that could be the right fit for you! Apply to be part of the NSF-funded REU program for summer 2018. Students will spend 8-weeks at an NSF-funded laboratory that supports Natural Hazard Engineering (earthquake shake table, tsunami wave tank, wind tunnel, etc.). Visit the website below form more information. UW students as well as those in community colleges are welcomed to apply. We are trying to distribute to as broad an audience as possible. analysis experience. A background in DNA analysis experience would also be preferred. Credit Offered: Capstone credit available (5 credits/quarter), could be used for a Winter Quarter capstone project(data collection and analysis begins immediately upon hire). would be presented. Training will be provided but preference will be given to students with previous experience and expertise in protein or DNA analysis. The student could also have the opportunity to co-author a scientific paper on this project if desired. How do fires affect seed germination? How do fertilization and herbivory affect the seed bank of a western Washington grassland? Please contact me if interested in learning more about these opportunities. Natasha Gowarnis will be our speaker this coming Monday 3:30 pm in Kane 120: “Bachelor Birds: Female Biased Mortality Contributes to Magellanic Penquin Population Decline”. I have attached a copy of the seminar schedule. Please distribute to those who may be interested. Should be a great seminar – come early for a good seat. NOTE: The seminar series meets in Kane 120 NOT 130 as indicated on the poster. Millions of people in the U.S. alone suffer from debilitating chronic pain. The Innovations in Pain Research Summer Program will expose 5-7 University of Washington undergraduate students to interdisciplinary research in pain to stimulate interest in future careers in pain research. This program will immerse undergraduate students in research to better understand pain and treatment mechanisms, develop new therapies, and improve access to evidence-based pain care. For questions, please contact urp@uw.edu or 206.543.4282. Project Summary: research historical forest landscape patterns to inform landscape level restoration treatments. The student will work to investigate, scan, organize, and interpret historical photos (1930-1950’s) from priority watersheds on the Mount Baker Snoqualmie National Forest and other areas of western Washington. · Basic forest ecology knowledge of forests west of the Cascades. · GIS coursework and some experience using ArcMAP. Stipend. $1000-2000 per quarter, depending on time committed by student. Travel costs will be reimbursed separately. Project Title: How Do Fires Affect Seed Germination? Fires dramatically change ecosystems, removing biomass, exposing mineral soil, and causing other changes. How plant communities respond to fire depends in large part on how individual species respond to fire. Fires can have both negative and positive effects on seeds. Too much heat for too long of a time can kill seeds or hinder germination, but pulses of heat can also stimulate germination. Furthermore, fires can have other effects, such as the stimulation of germination by some chemicals in smoke. Through a partnership with the University of Washington and King County, students are needed to develop a Forest Stewardship Plan for the 600-acre Soaring Eagle Regional Park in Sammamish, WA just east of Seattle. Students develop and deliver a professional-quality plan which King County will use for forest management decisions. The Forest Stewardship Plan will require a range of tasks with room for students to focus on a particular interest area. Students will be required to also assist in field work, analysis, and writing to complete the plan in coordination with other students, instructors, and King County foresters. Derek Churchill will advise students with assistance from Paul Fischer on this Capstone/Research, in conjunction with King County foresters. Contact Paul at pfisch5 for more info. Expectations: Participation in lab meetings, presentation of your project at the end of each quarter; written research proposal based on discussions with Prof. Doty and readings; written paper (publication style) at the end of the project; data kept in a notebook; presentation in spring at the UW Undergraduate Research Symposium. Prof. Doty will meet with you regularly to guide you and train you as will other members of her lab. You will be included as an author on publications resulting from your research. Since publication is the goal, it is essential that data collection is carefully performed and recorded. Type of Research: Primarily,the project involves quantification of plant growth but also involves some microbiology, plant-microbe interactions studies, and sterile plant culture. The student will inoculate and care for plants in order to assess the effect of endophytes on growth. Purpose: Addition of nitrogen-fixing endophytes of poplar onto rice and tomato resulted in increased plant growth and health. This project will involve assessing the effect of adding N-fixation mutant endophytes to these plants in order to determine if the enhanced growth is due to N-fixation or from hormone production by the endophyte, as well as determining what bacterial genes are necessary for N-fixation by the endophytes in the plant. There are a few more spots still available in next week’s Capstone Simulation! 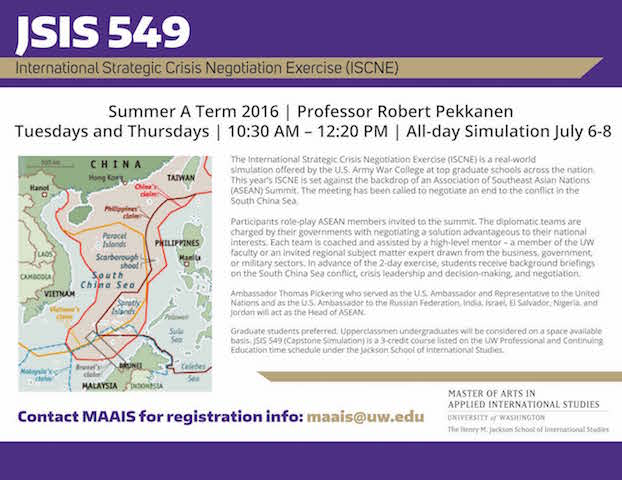 During Summer A session, the Master of Arts in Applied International Studies (MAAIS) program puts on an International Strategic Crisis Negotiation Exercise (ISCNE) in collaboration with the U.S. Army War College. It is a fascinating experience and a great personal development and career development opportunity. A short video of last year’s event is available here. The course is listed in the Professional and Continuing Education Time Schedule maais for instructions on registration. Hydrology, Environmental Engineering or a related field is required. A strong foundation in biogeochemistry, microbial ecology, soil physics or hydrology is preferred, and experience with quantitative modeling or isotope tracers is highly desired. This position requires working independently and constructively in teams through performing original research, meeting participation, and interdisciplinary collaboration. Strong written and oral communication skills are essential. Projects will involve both laboratory and field work at the University of Tennessee in the Departments of Biosystems Engineering and Soil Science (BESS) and Civil and Environmental Engineering (CEE), as well as the potential to collaborate with scientists at Oak Ridge National Lab. Assistantships include tuition, 12 month stipend and health insurance. The start date is Fall 2016 or Spring 2017 depending upon student admittance into the Graduate Program. The University of Tennessee-Knoxville is the state’s flagship research institution, the campus of choice for outstanding undergraduates, and a premier graduate institution. We are located in East Tennessee close to Oak Ridge National Laboratory and the Great Smoky Mountains National Park. The Department of Biosystems Engineering and Soil Science comprises an energetic group of tenure-track, research, teaching and extension faculty; and >100 graduate and undergraduate students. The National Institute of Environmental Health Sciences (NIEHS), one of the largest research agencies dedicated to improving human health, has a funded opportunity for underrepresented students at UW to conduct environmental health science-related research alongside faculty in the School of Public Health. This new program, Supporting Undergraduate Research Experiences in Environmental Health (SURE-EH) is now accepting applications from underrepresented UW students. Underrepresented students are those who come from a low income household, are first generation college students, or are a member of a group that is underrepresented in graduate education (African American, American Indian, Alaskan Native, Hispanic/Latino or Native Hawaiian, Native Pacific Islander). SURE-EH provides a meaningful opportunity to work with experienced faculty on a research project addressing the relationship between environmental exposures and human health. Work alongside faculty as a paid student researcher for up to 2 years, full-time during summer and part-time during the academic year. SURE-EH will provide academic opportunities to complement the research experience, including course recommendations, seminars, workshops, and research symposia. These educational opportunities will enhance your breadth and depth of the SURE-EH’s environmental health science training, and help you become a leader in the field of environmental health sciences. The application (including instructions and eligibility information) is online here (https://catalyst.uw.edu/webq/survey/tsterry/301204). 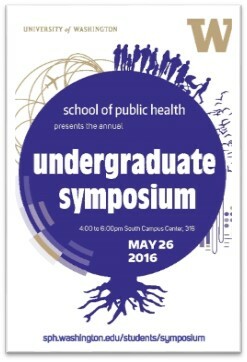 We are pleased to invite you to the third annual School of Public Health Undergraduate Symposium on Thursday, May 26, 2016 from 4 – 6 pm in the UW South Campus Center. The Symposium also provides a forum for current students, prospective students, faculty, and the community to discuss current topics in public health. We hope you’ll join us for this exciting event which will include poster presentations and a reception. Your RSVP is appreciated.